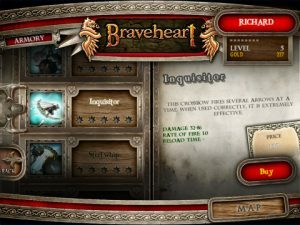 Let’s get this out of the way immediately: Braveheart HD by Gaijin Entertainment has nothing to do with the film or Mel Gibson. You won’t see a bunch of guys dressed in kilts screaming about “FREEDOM!” Nor will you play the part of a world-famous actor who self-destructs by leaving frothing voice-mail messages for the mother of his child. 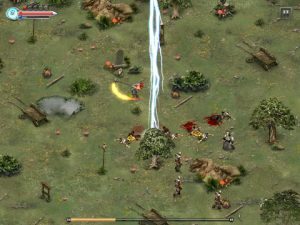 Instead, in Braveheart HD, you play the role of a drunken barbarian who must plow through wave after wave of enemies in order to find the legendary Holy Grail. It’s not quite as thrilling as a kilt-wearing, potty-mouthed maniac, but it manages to entertain, however slightly. Braveheart HD begins with an amusing animation that lays out the story nicely. In a drunken stupor, Richard (that’s you) inadvertently insults the virtue of the lovely princess. To avoid execution, he agrees to track down the Holy Grail for King Wilhelm. And, as an added bonus, if Richard is successful in his quest he will not only get to live, but will also be rewarded with the princess’s hand in marriage. 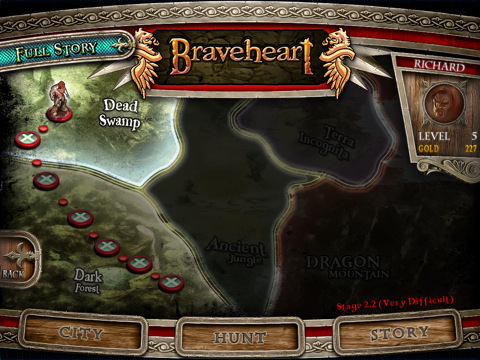 At first blush, Braveheart HD appears to have a lot in common with games like Torchlight and Diablo 2. Indeed, you’ll find yourself roaming the country, collecting scads of loot, while mowing over hoards of enemies in the process. Unfortunately, the game quickly reveals itself to be a much more shallow affair than the aforementioned games. Levels are nothing more than open arenas (forest, swamp, etc. ), and clearing these levels requires you to simply defeat a few waves of dimwitted enemies who most of the time come barreling at you with no artificial intelligence and therefore no regard for their own safety. You control Richard by either tapping where you’d like him to go, or swiping a path. You are given two basic attacks: melee and ranged, though you’re unlikely to get much use out of the ranged attacks as, again, the enemies rarely keep their distance. Your main melee weapon is a flail (ball and spiked chain), and to use the flail, you draw a quick circle around Richard to get him spinning, and every few seconds you’ll have to spin him again to keep the momentum going. 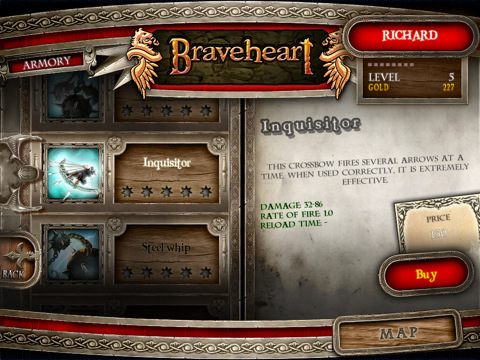 As he spins (and spins, and spins), the player needs only to direct him to the enemies and the loot, because as long as Richard’s level is high enough and you’ve increased his attributes appropriately, you won’t have to worry about tactics. For argument’s sake, let’s say you’ve reached a stage that is giving you trouble. Before you even enter the stage the game lets you know how difficult a time you will have based on your current level. When you encounter a mission that is just too tough for Richard, simply select “Hunt”, and you’ll be able to grind long enough to level up, get some loot, and buy more items. And then, you’re off to spin through yet another batch of baddies. In each level, you’re rewarded with special attacks, gold, and bonuses that allow you to gain health, or become stronger for a brief period of time. Additionally, weapons can be purchased and upgraded in between stages. This would’ve been a nice touch if the weapons didn’t all operate in exactly the same manner. For example, I was excited to save up enough gold to afford a sword so I could stop the dizzying effect caused by using the flail. Unfortunately, I was disappointed to find that Richard uses the sword exactly like he uses the flail: by spinning and spinning and spinning some more. While the game looks lovely, the between-level animations are far more interesting than the levels themselves, which consist merely of bland backgrounds populated by randomly-placed set pieces. Once again, Braveheart HD’s lack of variety is its downfall. Bottom Line: Unfortunately, Braveheart HD lacks variety in nearly every department. 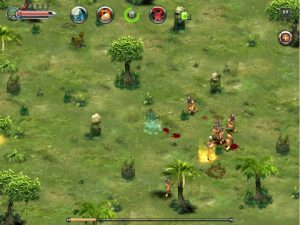 While the story is charming and humorous, the gameplay gets old quickly. 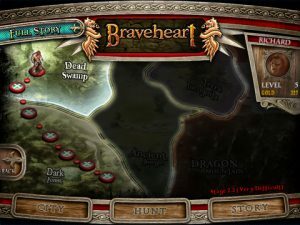 Braveheart HD is compatible with iPad. Requires iOS 3.2 or later.